Carrie’s Quilt – Ooh La la! 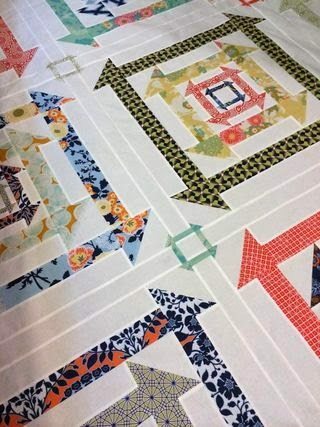 Carrie Nelson, who is the genius behind Miss Rosie’s Quilt Co and well known for her Schnibbles and Little Bites patterns and products, is my guest blogger today presenting her Nested Churn Dash quilt. As you will read from Carrie’s post, we shared a spot in the APQ QAL earlier this year. 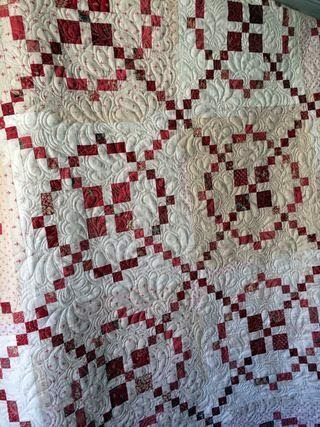 I was in constant awe of her quilt as I am for all her designs. Carrie’s low volume Burgoyne surrounded. Carrie has been posting pictures of her progress on Instagram using #nestedchurndash hashtag. 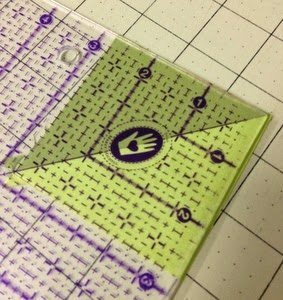 Carrie has created the most wonderful post about her assembly process and some very helpful tips on adjusting the measurements of the ‘Rails’ to support the true size of each nest. She has added some brilliant sashing and border additions to the quilt. Visit Carrie’s blog, La Vie En Rosie , to view the post and make sure you stop for a while and explore the rest of the magical world of Miss Rosie. There are many ways to make a HST. These are the most popular. Cut 2 triangles and sew them together. 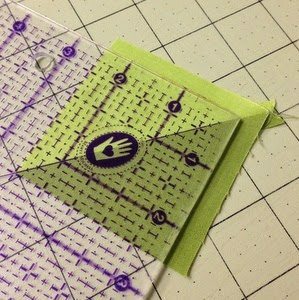 Use pre-printed foundation paper to make multiple units. The 2 square, 2 HST method. The 2 square , 8 HST method. Size of finished HST + 7/8″. Finished size of HST = 4 1/2″ x 4 1/2″. 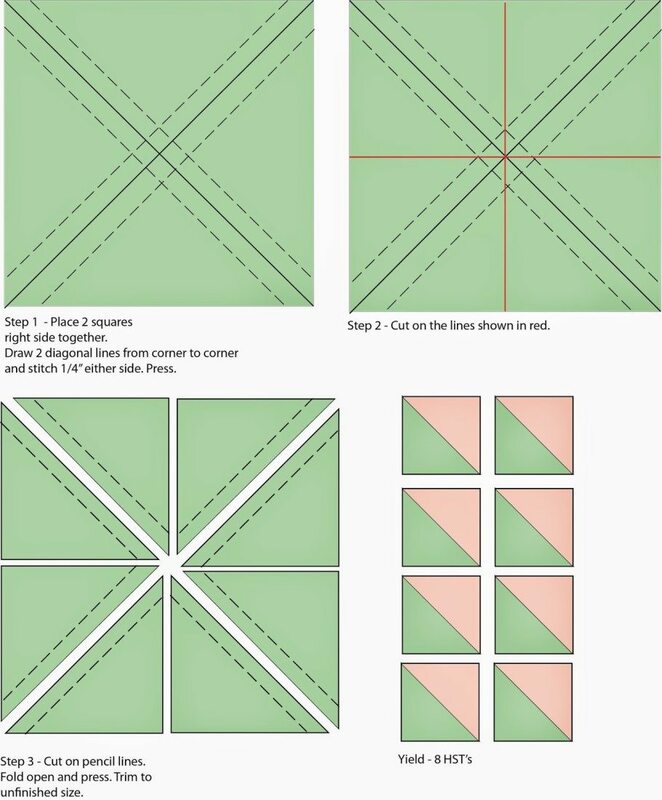 Cut a square 5 3/8″ and cut once on the diagonal to yield 2 triangles. 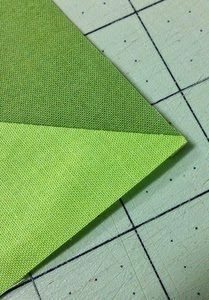 This method requires accuracy, has no waste but you will be sewing along a bias edge. My favourite paper is the Triangle on a Roll Paper. It has a very light consistency so it is easy to tear and comes on a range of sizes. It is great to make a few HST’s at a time or large quantities. The design of this technique supports little waste and negates handling bias edges. This is the method I use the most when blocks involve HST’s. It yields 2 HST’s at a time. Like the paper method, you eliminates handling bias edges. There is a minimum amount of waste and the trimming the HST’s to the desired size gives you a nice crisp, accurate block. Add 3/4″ – 1″ greater than the unfinished size of the HST. Unfinished size of HST is 2 1/2″ x 2 1/2″. Cut 2 squares 3 1/2 x 3 1/2″. N.B In the Nested Churn Dash pattern I have cut the squares 3/4″ large to minimise waste. This method has the same benefits as the 2 square, 2 HST method but with the added bonus of yielding 8 HST units. Double the size of the unfinished HST and add 1″. Unfinished size of HST is 2 1/2″ x 2 1/2″. Cut 2 squares 6″ x 6″ (2.5 + 2.5 + 1). Hint: adding an extra 1/4″ to these measurements gives you a little more room to trim block. The most important thing to do when trimming HST’s is keep the 45 degree line on your ruler on the diagonal line of the untrimmed HST. Trim top and side of the HST. Turn the block and trim remaining top and side of the HST. this HST is being trimmed to 2 1/2″ x 2 1/2″ unfinished. I have aligned the 2 1/2″ markings on the ruler on the side an bottom of the block. If you do not keep the 45 degree line of the ruler on the diagonal line of the untrimmed HST, you get an uneven corner and it will affect the meeting of intersecting points in block construction. I like to press seams open. I don’t get shadowing and the seams lie nice and flat. If you like pressing seams to the side, always press towards the dark side Luke. Reducing the stitch length and selecting a 50wt thread that matches or blends well is helpful when pressing open seams. Tomorrow we have Go Go Kim Niedzwiecki and her mini nested churn dash. 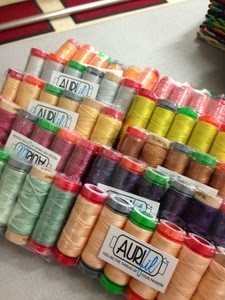 Upload your finished blocks or projects to the Flickr Group to win some beautiful Aurifil thread packs and other great prizes. Use #NestedChurnDash on IG, FB, Flickr and twitter. Winners will be announced 30th July 2014. 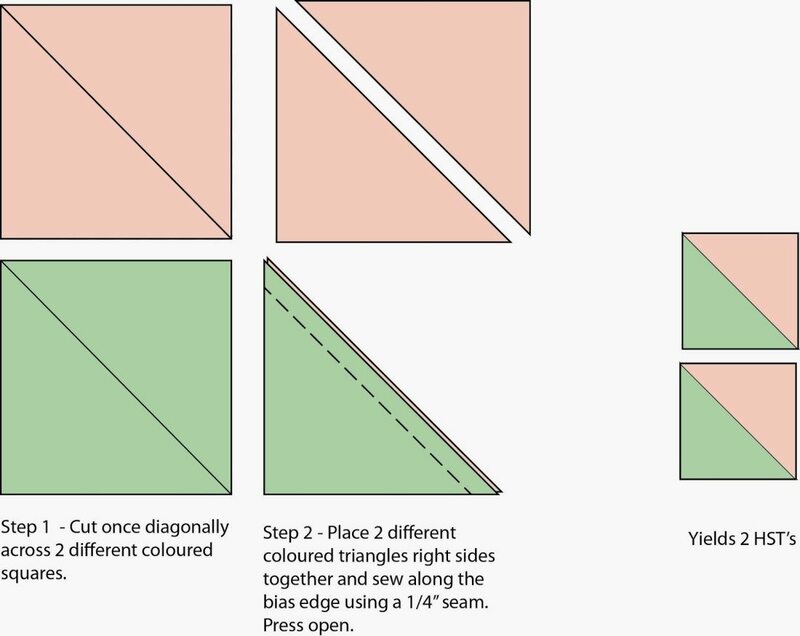 I have not tried the 8 half square method before but will have a go, have read about it before and with your instructions will be able to make some, . Interesting post – I need to try the 8 HST method – such a good idea! Thanks for recommending Triangles On A Roll! 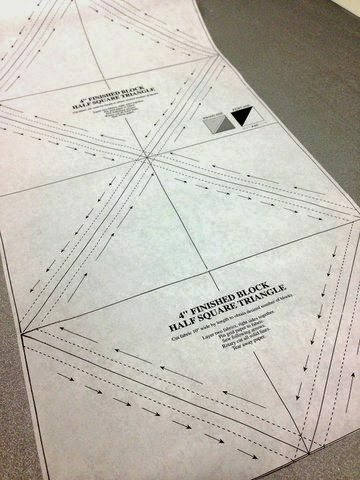 I am the Sales Manager with TOAR, and feel it's the easiest and most accurate way to make Half Square Triangles. I am starting this Nested Churn Dash this morning and can hardly wait to get started! Thank you for the kind words – I'm blushing.